The Oscars are usually the benchmark for each years fashions. This years Academy Awards once again was a chance for stars and celebrities to show off their red carpet style. The dresses, shoes, jewellery and even the hairstyles spotted at this years Oscars may forecast the fashion trends. Instead of one specific hairstyle ruling the red carpet, the hair at the Oscars came in verity of styles – with French Twists, Chignons along with Cascading Waves and classic short styles were all on display. Most noticeable was the full, luxurious head of hair tossed over and cascading down one shoulder reminding us of Veronica Lake or Kim Basinger. Leading the revival of the modern cascading waves was Jessica Chastain, who wore her hair to one side and tucked behind the ear. It was just effortless glamor and her beautiful red hair stood out from a sea of blondes and brunettes. All unmistakably old Hollywood vibe’s embraced by the likes of Zoe Saldana, Catherine Zeta-Jones, Jennifer Hudson and Reese Witherspoon. Chignons and French Twists, braided or with loose face framing strands usually rule the roost on the red carpet allowing stars to display their dress and jewellery without distractions. Classic short hairstyles have been in vogue lately and were a standout on the red carpet. Many famous celebrities like Anne Hathaway and Charlize Theron are seen at the Oscar’s sporting short styles reminding us of Audry Hepburn’s classic pixie cut. Among the short hair stars was the ever stylish Jane Fonda along with Halle Berry with her popular short spiky look. Forget having a Glam Gal on your arm. The best accessory for men at the Oscars this year appeared to be “facial hair”. Stars like George Clooney, Ben Affleck, and Bradley Cooper all strutted down the red carpet rocking some serious whiskers. And they weren't alone. Best Actor nominee Hugh Jackman, Jason Clarke from Zero Dark Thirty, and last year’s Best Actor winner Jean Dujardin all seemed to have gotten the memo to follow suit on this year’s beard trend. 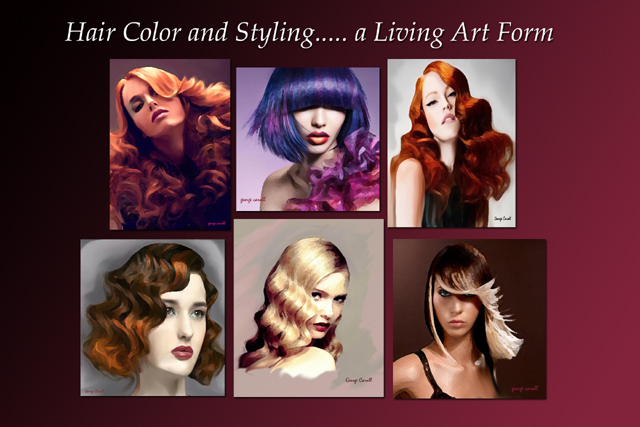 Hair Coloring has evolved into a Living Art Form. Creative hair colorist’s are now using splashes of colour for two tone effects and a full palette of up to six contrasting shades for both dramatic and suttle effects. Thanks to new dye technology and coloring tools like the Geo Palette hair color system and Foil Weaving techniques hair color artists are now only limited by their imagination and just how daring their clients are. It’s a brave exciting new world of color and the sky’s the limit; here are a few examples of creative hair color and styling effects showing up around the globe. It looks like the body is turning into a "Living Canvas". Tattoo's are showing up every where so its not a surprise to see colorful hair styles along side Tattoo's. What started as way of covering the signs of aging (gray hair) has turned into a "colorful living art form". It's a Brave New Colorful World. As a hair stylist with a hair styling studio located in the heart of the entertainment industry I’ve seen many actors opted for hair restoration procedures in order to create a youthful look and the illusion that time has simply stood still. The continuing demands on celebrities to keep their youthful good looks, seems to be of great interest to the tabloids. Perhaps the most famous hair transplant recipient is Sir Elton John. With years of wearing toupees and hats he became fed-up and under went a series of replacement procedures. After appearing on stage with a full head of hair and new hairline the tabloids read; “Tonsorial Wizard Grows Hair on Rocket Man”. Jokes about hair loss are as old as dirt, but not as old as rocks. Two comedians, Tom Arnold and Dennis Miller are the first to tell you they’ve had this done and I’m sure you’ll agree that both look much younger with thicker hair and youthful looking hairline. Hair restoration is not just reserved for film and television stars. Politicians, fashion designers, musicians, business executives and man from all walks of life now recognize the importance of hair and how it affects their image. Hair loss is a state of mind, “if you don’t mind _ it doesn’t matter”. However, with today’s technological advancements and affordability it's now possible to do something about hair loss. And because it permanent it can make you feel good about how you look for years to come. Having had a hair restoration procedure myself by Dr. Robert Elliott, a pioneer in hair replacement here in Hollywood, I can tell you first hand that it’s painless, lasts a life time and has been well worth the expense. Hair restoration is a simple out patent procedure that involves hair follicles being taken from the back and side of the head, where hair is thickest and resistant to loss, and inserted seamlessly into the thinning spots and can give you a natural looking “hairline”, even up close. When applied by a skilled restoration artist with years of experience like Dr. Elliott it will look natural and totally undetectable. It looks like Beyoncé can pull off absolutely any hairstyle: from long, sleek strands, to tight, springy ringlets, and multicolored tones…. this diva’s hair is always on point! Although she is known for her fierce dance moves and amazing voice, she has a terrific sense of style and her hair styles are always changing. She has gone from blonde to sleek and straight to natural curly and even having a tint of red in her hair. Beyonce is one of the current A list super stars who really knows how to rock their hair color and used this to full effect over the years. It’s no wonder that she was quickly snapped up to be the face of L’Oreal hair color! Her signature color is beautiful mixture of golden blondes and honey caramel brown tones, and after years of experimenting with lighter and dark shades, she seems to have settled on a mid range look that she has totally made her own. I've always loved a diva that isn’t afraid to experiment with hair color, and digging through the archives it’s nearly impossible to find an occasion where Beyonce has got it wrong. There have been some criticisms that Beyonce’s preference for a lighter hair color is disrespectful to her African American heritage, however she has gone on record saying how hurtful these comments are, and like any girl, she just wants to have a bit of fashion fun. Beyonce has said that she never dreamed that one day women around the globe would walk into a Salon and ask for here hair color and style.